ThinkTQ, Inc. is the world's leading publisher of virtual training products for personal and professional excellence. In short, we train WINNERS! TQ is for people who are serious about personal growth... people who realize that it has become a "Perform or Perish" global economy. We have hundreds of products and services all designed with a single objective: To help you quickly and easily find the success you so richly deserve. Below you will find a list of our Current TQ Specials! Note: New TQ Members may select a FREE Personal Workshop from the list below and pay only shipping and handling. We highly recommend you first take the full TQ Test to see which area of your performance needs to be improved first. 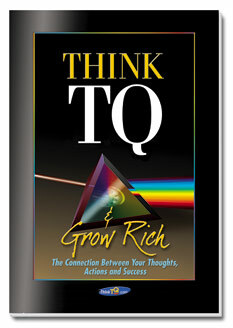 Think TQ & Grow Rich is not just a "primer" but a powerful way to start thinking about the connections between your thoughts, actions and success. At just $5 bucks, it's a wonderful way to look at your life through the lens of wealth, power and happiness. In study after study, through years of scientific research, we have found that highly successful people... people in the TOP 1% by any standard: Wealth, Power, Happiness... people who are living a life of meaning and significance... ALL have one thing in common. They ALL have a highly evolved, unstoppable sense of PASSION, PURPOSE... and MISSION. You have just found the most IMPORTANT resource for personal and professional growth ever developed. Want to move down a career path that is both emotionally, and financially rewarding? Want to differentiate yourself among your peers? Want to produce better results — personally and professionally? 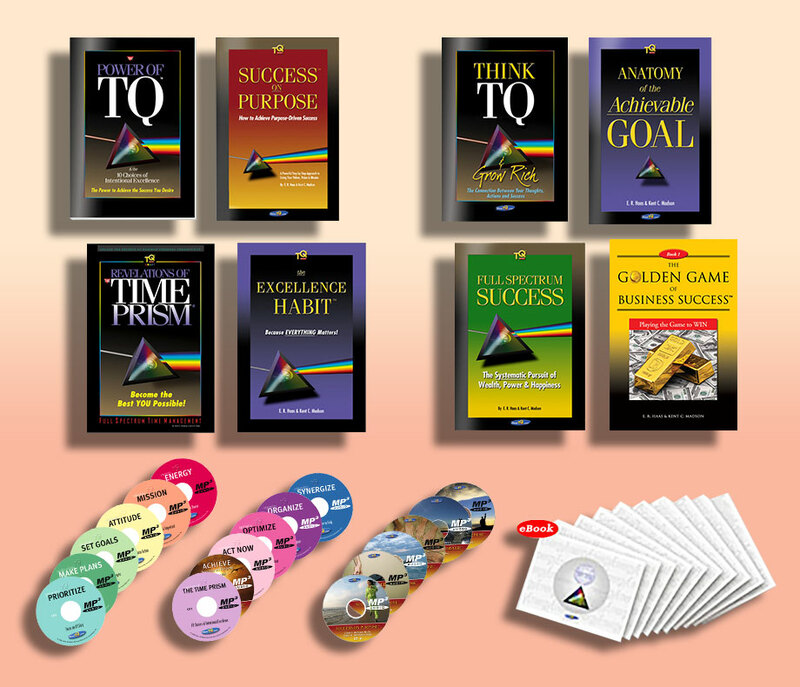 This bundle is for you if you want to know — with complete certainty — what you are doing RIGHT... what you are doing WRONG... and specifically what you need to do DIFFERENT to achieve your most important goals in the next 1, 5, even 10 years out. We have packaged our unique performance Assessment and Evaluation Tools, together with several important MyTQ training programs, to give you a tremendous head-start this year and every year thereafter. Unleash the SuperStar Within! If you sincerely want to move your dreams and goals off the page — and into your life — this bundle is for you! Find out what's holding you back, and eliminate it. The Power of TQ is designed to help you systematically identify, isolate and eliminate what's holding you back from producing superior results. The Power of TQ contains a 100 point personal assessment and comprehensive, 172 page evaluation of your performance effectiveness. For the first time ever, you will see your strengths and weaknesses in a whole new light — and learn how to quickly transform performance negatives into powerful positives. Your custom-published, made-to-order personal book includes 33 entirely different views of your performance, 64 unique full color charts and graphs, 4 engaging exercises and the most eye-opening assessment of your success skills you will ever read. This package will change your life. In addition to your personal copy of The Power of TQ, you will be given unrestricted access to the Dreams... Goals... Plans... and Performance Resources within MyTQ. This is the single best way to connect what you want... to what you need to do different each day... to actually living your dreams -- rather than just talking about them! SAVE $200: Order The Power of TQ SuperStar Bundle for just $49.95*, and receive everything below! Purchased separately, this package would cost you $289.75. Your satisfication is 100% guaranteed, which means that your purchase is 100% Risk Free. Maybe you are constantly "getting ready to get ready" and never get to the part where you are supposed to make your life an action adventure! Or, maybe you are a high-achiever who simply wants to put a razor-sharp edge on your performance. New TQ Members may receive ONE of our extraordinary Personal Workshops at no cost during the first 3 days following registration. This offer is subject to change without notice and may not be available to all members. The 10 Personal Workshops described below are all included in the Full Power of TQ System. Each workshop focuses on a key area of your performance -- and shows you how to improve it -- in just 1 hour flat! Normally $39.95, one of these essential audio training programs and workbooks is yours FREE as a special introduction to the TQ System and our family of products. A 1-hour instructional and highly motivational Audio CD. Listen to it often to quickly master essential success skills! A 65 page self-paced PDF Workbook with a simple to follow, 30 day personal improvement and review program! 150 of the best ideas -- condensed and distilled from the best brains in the world -- to help you achieve your dreams sooner, rather than later... or maybe never. 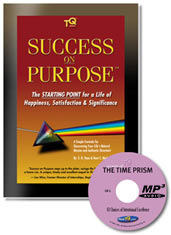 Order now and you will also receive our best-selling book, Revelations of the Time Prism PLUS 2 more 1 Hour audio programs: Secrets of The Time Prism and 10 Choices of Intentional Excellence... PLUS our Achieving Success On Purpose audio!